Feel at home on Gili Air. 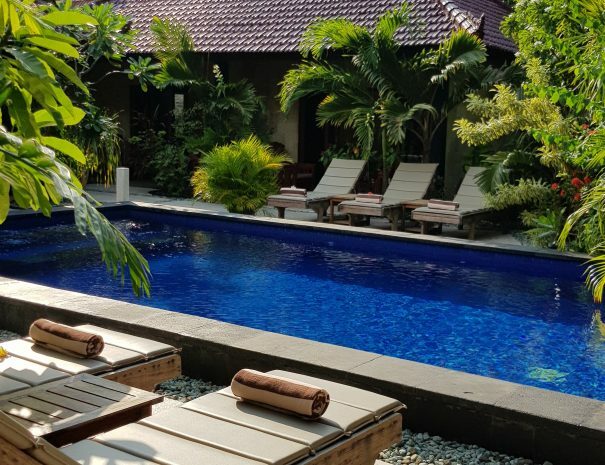 Senang Villa, meaning “Happy Villa”, promise you a joyful stay. With only five rooms, it guarantees a private atmosphere. 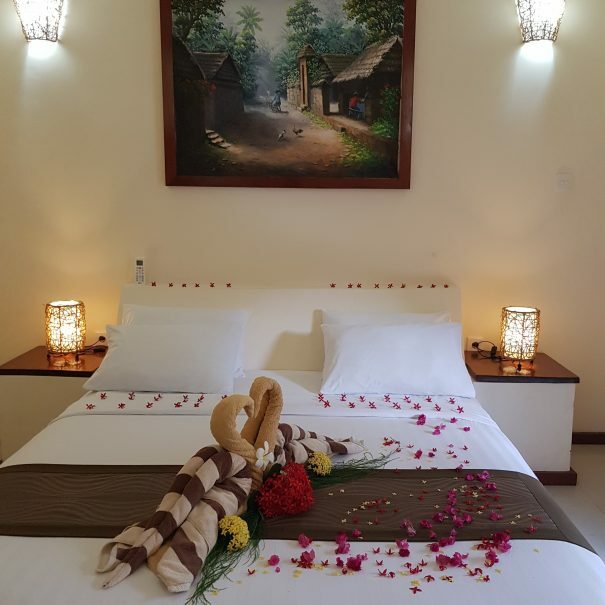 It is the place to share special time with your partner, friends or family. It is strategically located on the West Side, which is known as Sunset Area. Since it is about 75 meters from the main path, you can enjoy both tranquilities by the pool and relax at the next beach bars and restaurants. 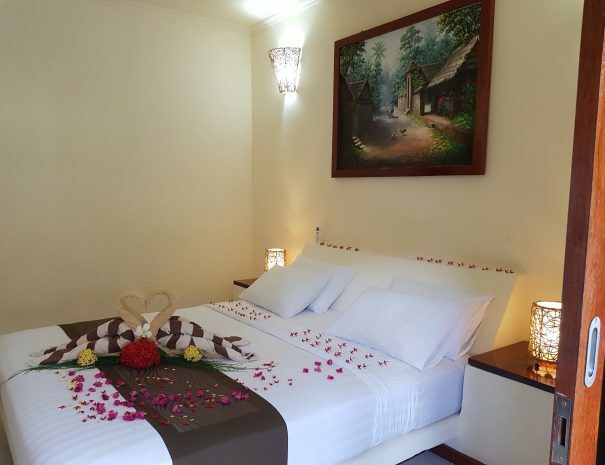 Senang Villa has 5 air-conditioned rooms and common area with swimming pool and a lush tropical garden. 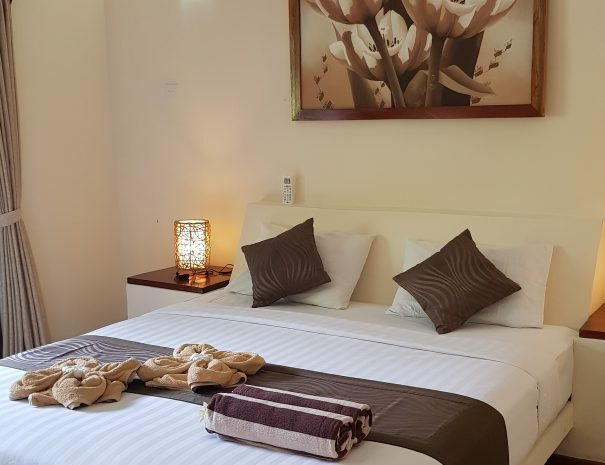 Each room has a high-quality interior, AC, TV, fridge and en-suite outdoor bathroom with a hot and fresh water shower, safety box and a private terrace with pool view. If you come with your whole family or friends why you do not book the whole villa to enjoy more privacy? Please book direct for the best rate! Villa Senang is located on the west coast of Gili Air. It is just 75 meters from the beach. The west coast is known as sunset area with views of Bali's Mount Agung. 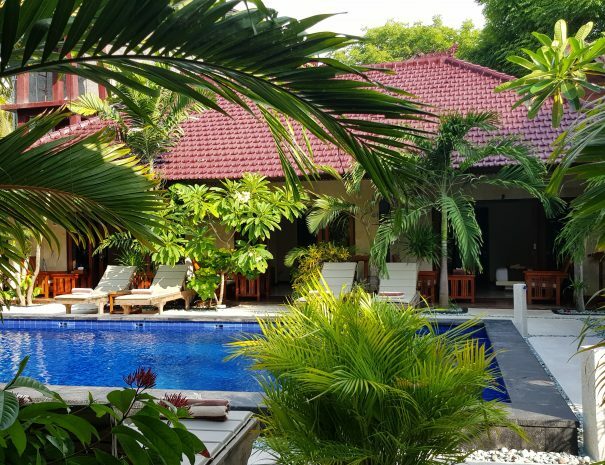 In both of our property you will find different tropical flowers and fruits. Free pool & beach towels available. We provide a small selection of snacks and drinks. There are also some restaurants which deliver food to our places. Breakfast is already included in your room rate. Please let us know in advance if you have food allergies ( celiac disease, lactose intolerance ) or preferences (vegan) and we are going to prepare a special breakfast for you. We accept credit cards (VISA, Mastercard) without surcharge. We offer laundry service at fair prices. Free WI-FI access in all areas. Each room has it own ensuite bathroom. Does this look like fun? Sleeps 2, Pool View, King Bed, AC. Copyrights © 2018 Aslam Zakaria. All rights reserved.